Cherry-Walnut Wood Frames (Shown with Amber Ocean Lenses) Cherry frames and arms on the outside, laminated to 14 additional layers of contrasting Walnut and Cherry for beauty and strength. Cherry: Strong, smooth and can be sanded to a glass like finish. 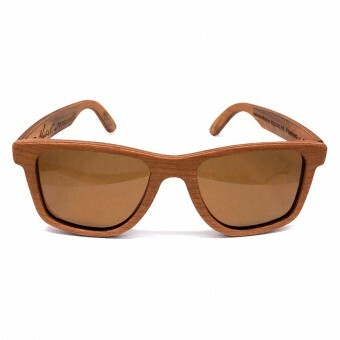 Its color varies from light brown to reddish brown, with a distinctively attractive grain. Walnut: Picture a rich chocolate river with the occasional lighter shade quiescently streaming its way through like a small canoe wake. Walnut is a hard, dense, tight-grained texture that can polish to a smooth finish. The color ranges from vanilla white to a dark chocolate color. Cherry-Maple Wood Frames (Shown with Smoked Brown Lenses) Cherry frames and arms on the outside, laminated to 14 additional layers of contrasting Maple and Cherry for beauty and strength. Maple: A very dense, fine textured and moisture resistant wood that can withstand a bit more abuse. Its color is pale to light brown, with natural swirls and twists in the grain. 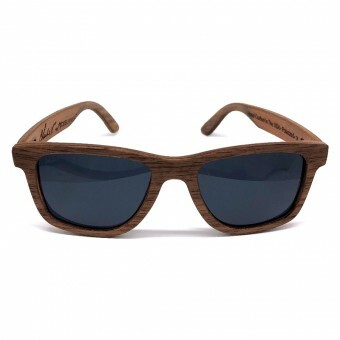 Maple-Walnut Wood Frames (Shown with Smoked Black Lenses) Maple frames and arms on the outside, laminated to 14 additional layers of contrasting Walnut and Maple for beauty and strength. 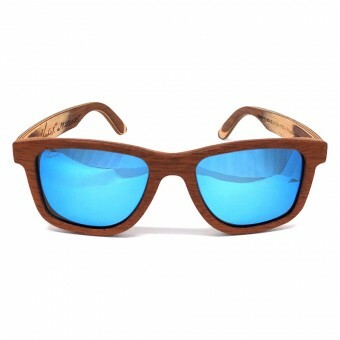 Mahogany-Maple Wood Frames (Shown with Ice Blue Reflective Lenses) Mahogany frames and arms on the outside, laminated to 14 additional layers of contrasting Maple and Mahogany for beauty and strength. Mahogany: One of the most coveted woods in the world for fine furniture making. Also popular for those skillfully crafted, classic runabout motor boats popular during the 1930's-1950's. Color can vary from deep red-brown to dark red with a very distinctive grain and medium coarse texture. Maple: A very dense, fine textured and moisture resistant wood that can withstand a bit more abuse. Its color is pale to light brown, with natural swirls and twists in the grain. Walnut-Cherry Wood Frames (Shown with Sunburst Reflective Lenses) Walnut frames and arms on the outside, laminated to 14 additional layers of contrasting Cherry and Walnut for beauty and strength. 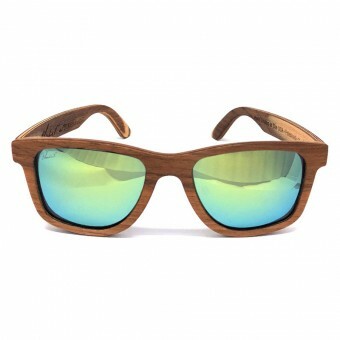 Walnut-Maple Wood Frames (Shown with Ice Blue Reflective Lenses) Walnut frames and arms on the outside, laminated to 14 additional layers of contrasting Maple and Walnut for beauty and strength.